Art and meditation can take on many forms and Zentangle patterns combine both of these awesome things in a creative way. If this idea has piqued your interest, there are a few rules you’ll need to know before you begin drawing with dots, lines, curves, S-curves, and orbs, and the sites offered below will help you gain an understanding of how to use them to create Zentangle art. You’ll find some videos at the bottom of this post that offer instructions on how to make these designs as well. Note: Please feel free to play with the concept of only using dots, lines, curves, S-curves and orbs to make art as well. Consider it a challenge to only use those things in a drawing! You will also need: A ruler and scissors to cut paper into 3.5″ squares or tiles. Zentangle – Learn how to get started with this meditative art from the people who designed it. IAMBORED: 30+ Easy Zentangle Patterns to Give You Great Ideas For Your Own Zentangle Art – Answers the question: What is Zentangle? and offers some interesting pattern ideas. Craft Whack: Inspired by Zentangle Patterns and Starter Pages – Offers printable patterns and ideas for making the designs created a little more interesting. wikiHow to Make a Zentangle – Explains what a Zentangle is and the difference between a Zentangle and a doodle. 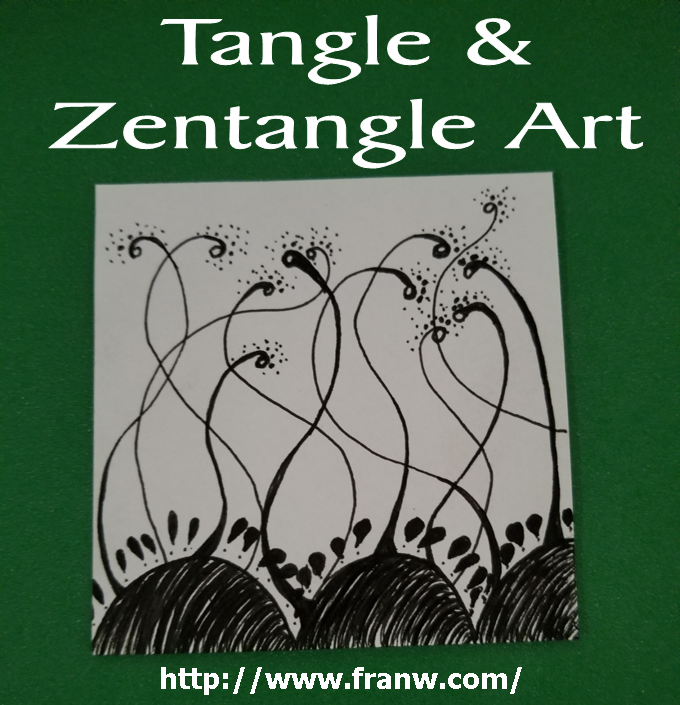 Renee Tougas: A Beginners Guide To Beginning Zentangle – The author of this site shares her experience with Zentangle, as a beginner. TanglePatterns: From the site: An index and graphic guide to the best Zentangle® patterns on the web and how to draw them. Also, What is a Zentangle? and why a pattern is not always a tangle. Art For Kids & Robots: Totally Easy Zentangle – This site offers a couple of kid-friendly Zentangle activities. Tim’s Printables: Circle Templates, Pentagon Template 3″, Triangle Template 3″, Kite Template 3″, Square Template 3″ – Use the templates to design creative drawings within or on the outside of the template. YouTube: Tangle & Zentangle Art Playlist – Includes videos for beginners and advanced designers and pattern ideas.